Author: Lotta Harjula. Series edited by: Bernd Heine, Wilhelm J.G. Möhlig. 14 pp. Roman, 220 pp. 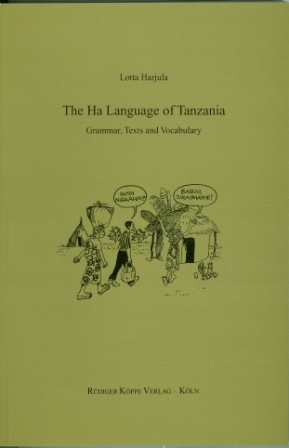 Ha (Kiha) is a Bantu language spoken in Western Tanzania by the Waha, who form the majority of the population in the three districts of the Kigoma region east and north of Lake Tanganyika. It is a typical Bantu language with 16 noun classes and a complex verbal morphology. It is highly agglutinative and possesses a pitch-accent system. Guthrie alotted Kiha to his group D.60, together with Kirundi, Kinyarwanda, Vinza, Hangaza und Shubi. The number of speakers is estimated to be about 800,000. Apart from a few language descriptions and some religious texts produced at the beginning of the 20th century, no modern grammar had been produced up to the present study. Its results are based on three field trips in the Kigoma region during 1997–2003. The data was predominantly extracted from original Ha texts drawn from several narrative genres and additional conversations, all transcribed from recordings and translated into English. The aim of the book is to establish the first descriptive basic grammar of Kiha, detailing morphology, tonology, phonology as well as syntax. Thus it provides a thorough basis for further comparative and historical research on Kiha as well as a starting point for studying the other hardly researched languages of the region. The appendix of this monograph contains a text collection and a Kiha-English word list comprising 3,400 entries.